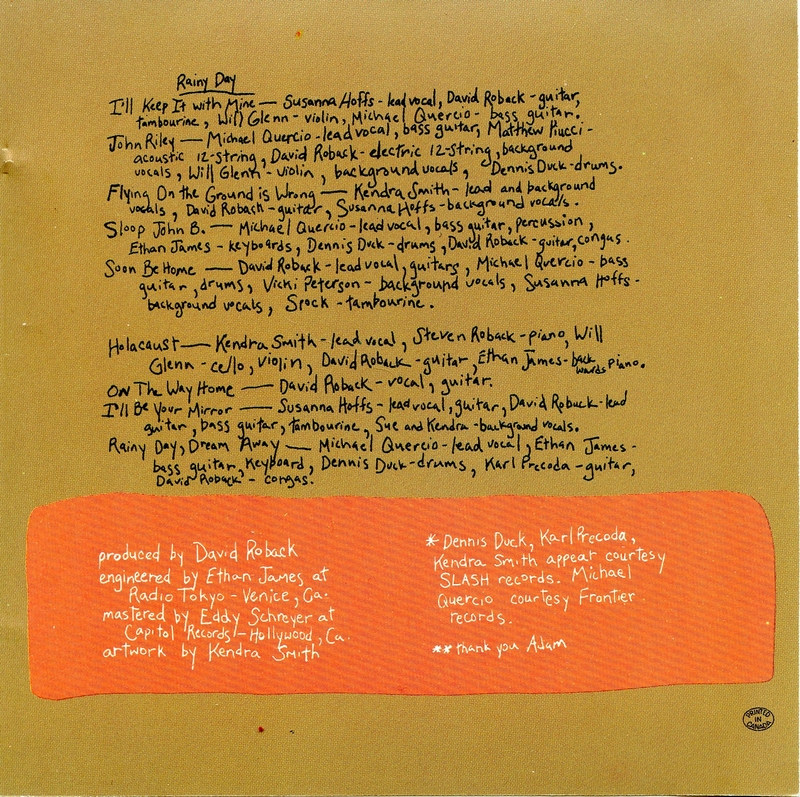 On one or some enchanted day(s) or evening(s) in 1984, a ragtag group of Paisley Underground pals came together at the Radio Tokyo recording studio in Venice, Ca., for an endeavor said to have been dreamt up by David Roeback, co-founder of Rain Parade. The idea: pay homage to those artists and songs that had inspired him and his compatriots. I should mention that “pals” and “compatriots,” in this context, translates into members of Rain Parade, the Bangles, Three O’Clock and Dream Syndicate. 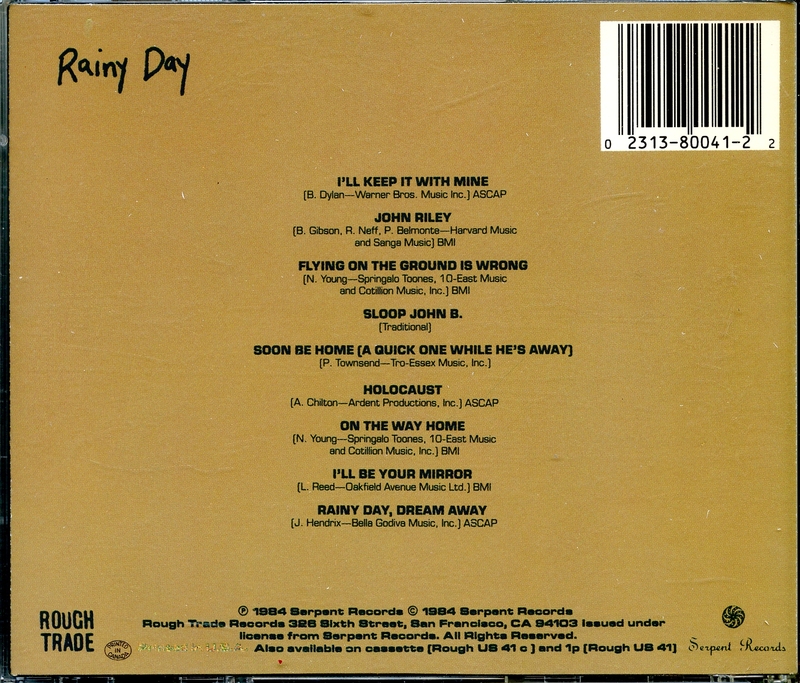 That’s evident on the Roeback-produced Rainy Day collection, which was stamped onto vinyl in 1984. It curates classic – but, “Sloop John B” aside, not necessarily well-known – tracks from the Beach Boys, Big Star, Byrds, Buffalo Springfield, Bob Dylan (by way of Nico or Fairport Convention, most likely), Jimi Hendrix, Velvet Underground and the Who. Here’s Susanna Hoffs fronting “I’ll Keep It With Mine,” for example. In today’s world, one can learn about most songs in seconds. For instance, the Wikipedia entry explains that Bob Dylan wrote “I’ll Keep It With Mine” in 1964, and never released it until decades later; Judy Collins issued it as a single in ’65; and Nico covered it on her 1967 album Chelsea Girl, followed a few years later by Fairport Convention, who recorded it for their What We Did on Our Holidays LP and also released it as a single. In the ‘80s? It could take weeks, months and even years to figure out a song’s recorded history, let alone track down and hear the different versions. Nico’s Chelsea Girl was long out of print by then, after all; to acquire a copy meant one had to hope an area used-record store had it in stock. 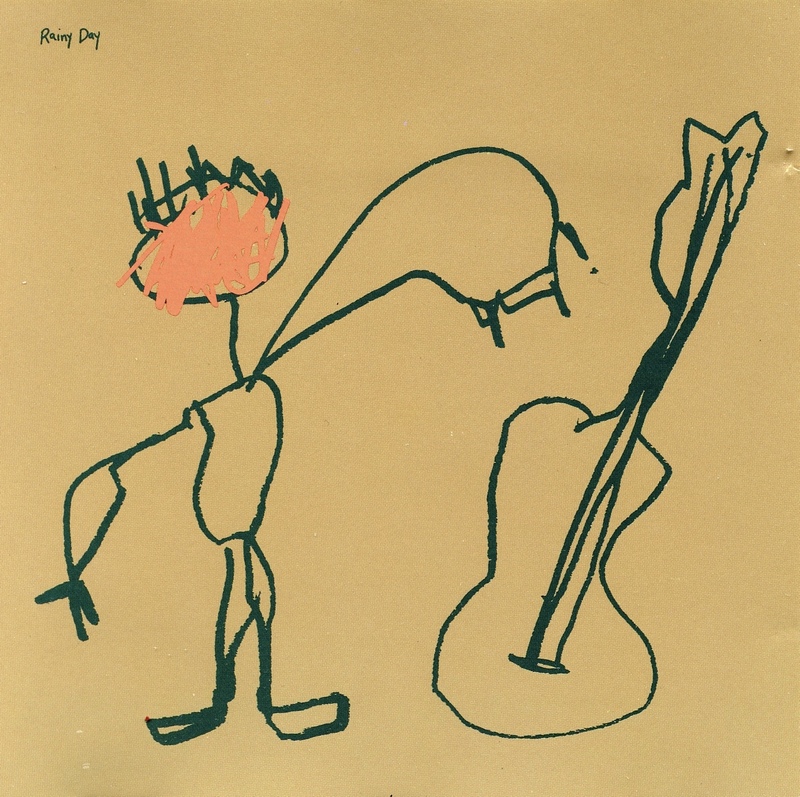 Back on point: Just like Chelsea Girl, few folks actually bought Rainy Day. It was released by Llama Records in the U.S. and licensed by Rough Trade for the U.K., and though some of us recognized – or would soon recognize – the names of the players, most folks had no clue as to who they or their bands were. Make no mistake, however: It’s a sheer delight. By 1989, when the collection was issued on CD, Susanna Hoffs was likely the best-known entity thanks to the success of the Bangles. But she’s far from the only reason to search for this gem; each of the nine tracks adds something unique to the original. I’m sure it won’t stick around YouTube forever, as it was uploaded by a user and not the label, but here’s the album in full…enjoy it while you can. 2) Garland Jeffreys with Marshall Crenshaw and Jonathan Edwards – “Waiting for the Man.” Since Reed’s passing, Garland has paid tribute to his old pal, whom he met in college in the early 1960s, with a cover of this classic Velvet Underground song at just about every show of his I’ve seen. This great performance hails from September 2015 at the Ardmore Music Hall in the Philadelphia suburb of Ardmore, Pa., where he was part of a round-robin concert with Marshall Crenshaw and Jonathan Edwards. 3) Susanna Hoffs – “When You Walk in the Room.” Susanna’s rhythm section had another commitment, so this November 2012 concert was just her, guitarist Andrew Brassell and a roadie on tambourine/percussion; and, as this song shows, the result was wondrous. She sang a few covers throughout the show, including the Beatles’ “All I Got to Do,” but this spin on the classic Jackie DeShannon song (which was a big hit for the Searchers) was my favorite. 4) Rumer – “American Dove.” This rendition of the Laura Nyro classic hails from Rumer’s first-ever concert in the U.S. in October 2011, at the World Cafe Live Upstairs in Philadelphia. We were two of about 50 folks in attendance. 5) Diane Birch – “Heavy Cross.” What’s amazing about this mesmerizing 2010 performance, which hails from French TV show? Everything. Neil Young with Booker T & the MGs – “All Along the Watchtower.” In the early 2000s, Neil hit the road with the legendary Stax group. Their rendition of the Dylan-Hendrix classic is best summarized with three words: Crank it up! 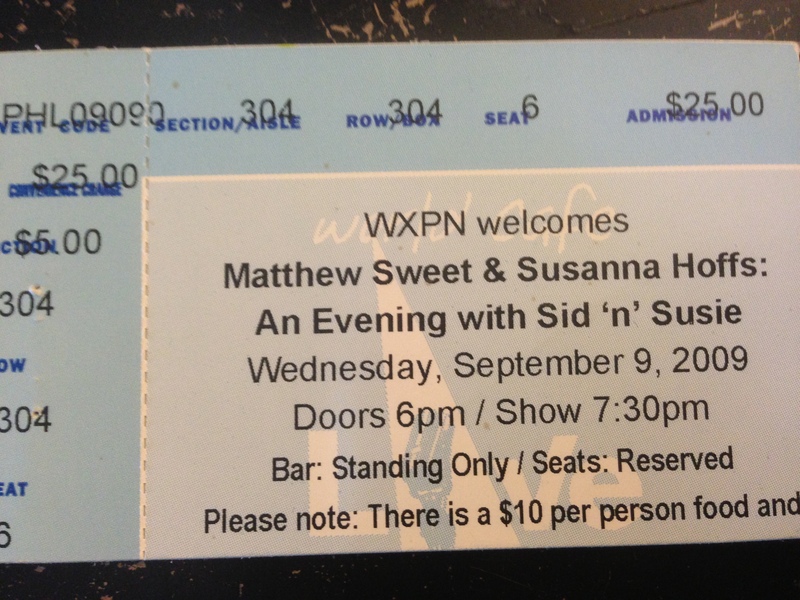 Sid, of course, is Matthew Sweet; and Susie is Susanna Hoffs. They began working together in the 1990s as 2/5s of the band Ming Tea, whose music was featured in the Austin Powers films – no doubt because one of the other members was Austin Powers himself, Michael Myers. The two apparently enjoyed the experience (and each other) so much that they kept on keeping on, eventually releasing the delightful, 1960s-themed Under the Covers, Volume 1 album in 2006 and Volume 2, which mined the music of the 1970s, three years later. I wrote about both in my review of Volume 3, which navigates the 1980s, a few years back, but the short and sweet of that is this: I loved the first and liked the second. The former was a perfectly cut jewel; the latter was equally polished, yet not without its flaws. Not flawed enough to stop us from getting tickets to see them in concert, mind you. That said, for whatever reason, we learned of the World Cafe Live show days (weeks?) after it went on sale and wound up stuck in what were, for us, not-so-good seats: at a table a fair distance away from the stage, adjacent to the soundboard. But come this night, at the World Cafe Live in Philadelphia, bad seats and no rehearsals didn’t much matter. Matthew was funny; and Susanna was charming. 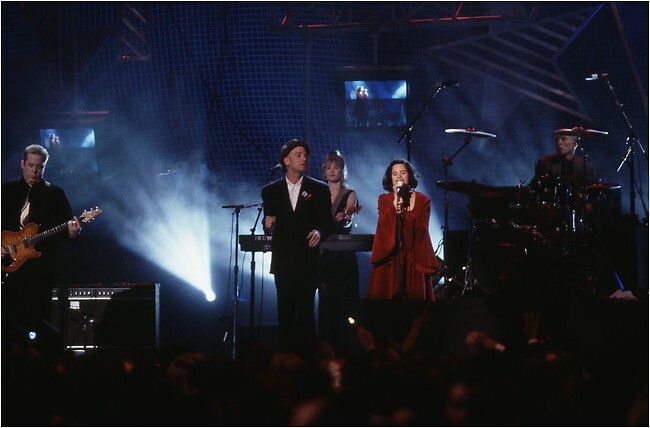 Their love for the music shone like diamonds, and the show was an absolute delight – even with the vocal intrusions of a rather intoxicated gent who kept yelling for Todd Rundgren’s “Hello It’s Me” even after they performed it. Anyway, as the above clip shows, it was just Sweet, Hoffs and guitarist Paul Chastain (of the power-pop band Velvet Crush) on stage.